How to NOT go dog fishing! Please only take as many as you will truly eat. Too many people take more than they need. 5 or 6 is plenty to make a huge clam chowder. 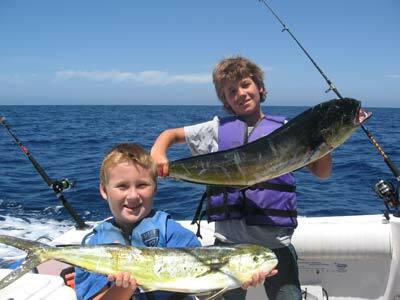 Gavin and Eli with Dorado (Mahi-Mahi) off San Diego. One day last August we caught 16! They were boiling all around the boat. We let most go, but we love to eat them! Fish tacos, broiled with garlic, and they are great many ways. Just like with fishing tackle, there are many great videos on fishing tips all over YouTube! Also, on Google we find tons of great info.